This summer, I had the distinct honor of working as part of the Montgomery Village Promise Academy. The goal of the academy is to take "at-risk" middle school students and share leadership skills and strategies with them. As a resident of this neighborhood, it has been on my heart from the beginning to help serve the young people in this community through martial arts instruction and leadership. Originally, I was asked to come in two times during the week-long camp. After the first day, I was asked (by the kids) to come back every day and even to join them on the ropes/confidence course at the end of the week! Phoenix Gaithersburg is positively changing lives of students IN the dojo and IN the neighboring communities...this is the way of the warrior. Jesse had one of the most unique belt tests to date. I really felt that Jesse was ready to test for his blue belt, but was waiting for the perfect timing. That perfect time came recently when I overheard that his older brother (Big Jake) had a family obligation and would not make it to class. Jesse tested that afternoon. As a fifth grader, Jesse is in that awkward place where he's not a teenager yet, but he's also not a little boy anymore. I chose to test Jesse (without the watchful eye of mom and dad, or big brother) as a way to let him see what he's made of. Jesse had a great test and his parents and I agree that it was, in a small way, a rite of passage for him that he will remember for a long, long time. It is no coincidence that Jesse's belt test came at a time when Phoenix Gaithersburg split into our youth and teen/adult classes. Jesse now joins Jack as the senior ranking students in the youth class. Jesse does a great job with this class and his encouragement and feedback to new or younger students is always specific and helpful. He could serve as an example to all karateka in this area! 1.) They come to class- These three do not miss class unless they are deathly ill. This shows dedication from them and their parents. 2.) They work hard- They are always asking for more challenges and are setting the pace for the other karateka. 3.) They do the extra work- They watch videos, they talk about karate outside of class, they come to all of the optional training sessions. Of course, it doesn't hurt that these three young men have examples of a strong work ethic at home! We're now one week removed from our first major tournament, and I still cannot express how proud I am of all of the fighters from Phoenix Gaithersburg! Folks who have never participated in a one-on-one competition like this cannot fathom the amount of pressure that every competitor experiences when they step onto the mat. However, when the match is said and done, it is in that moment that we find out what we're made of. As an instructor, I am possibly more concerned with how my students respond to victory AND defeat. Tournaments like this provide us with an opportunity to see if those character lessons from the dojo are really sinking in. in character. They were truly gentleman in victory and defeat." 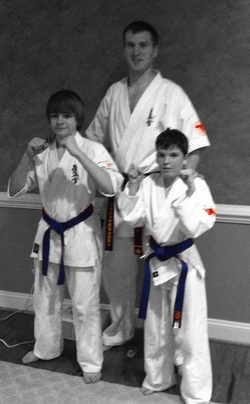 Today Jack (right) became the second student at Phoenix Gaithersburg to successfully pass the test for blue belt. Those who train with use know that, pound for pound, Jack is the hardest hitter around! Throughout his kumite, Jack showed power, spirit, and control. Beginning Thursday, Jack will join Tim (left) in the highest rank of students in Phoenix Gaithersburg. In the Phoenix Way, a blue belt is a blue belt. There is no designation between youth and adult. We, as Yudansha (under the leadership of the Shihankai), have chosen to draw the proverbial line in the sand and let our standard be the standard; regardless of age. Jack (halfway through the 4th grade) is a prime example of a young man who has earned his new rank! 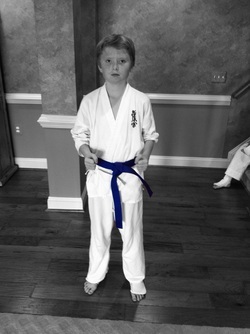 Remember Jack, you may only wear your belt in the dojo...but you ARE a blue belt wherever you go. Make the Phoenix proud as I know you will! - Growing from a group of 8 to a group of over 20! - Competing in the Enshin tournament with amazing success! 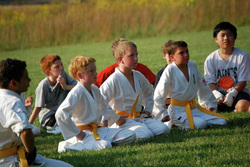 - Hosting a 2 week karate camp in August! - Having several yellow belt tests! 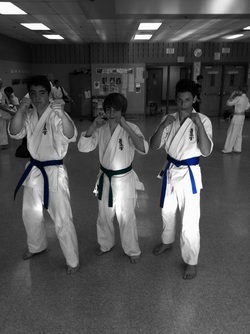 - Having our first blue belt test! - Taking a small group to train at The Phoenix Way in New Jersey! As Sempai, I am proud, humbled, and extremely thankful! I am proud of each member of Phoenix Gaithersburg. Proud of their hard work and tenacity. Proud of the hours they have put in without complaint. I'm left humbled by the generosity and thankfulness shown to me by students and parents. I'm also humbled that the Shihankai of the Phoenix Karatedo Association, particularly my instructor Shihan Melanson and Dai Sempai Franklin, trust that what we are doing here in Gaithersburg is of the highest quality and keeping the spirit of the phoenix! I am thankful that the students under my instruction are hard working, no nonsense kind of karateka. I am also extremely thankful for generosity shown by the Titus family in allowing us the use of their basement as our training facility! Without them, there would be no Phoenix Gaithersburg! Osu to all! Our 2011 training schedule kicks off Monday at 4:00! Today Phoenix Gaithersburg celebrated another milestone. After an excellent test marked by the spirit of the Phoenix, Tim P. was honored as the first karateka in our dojo to earn the blue belt. Tim has shown consistent dedication since joining us and has shown an impressive degree of initiative and desire to improve in and out of the dojo. Whenever an instructor presents a new belt to a student, it provides us with an opportunity to reflect on the time when we earned that same belt. In many ways, Tim's blue belt test mirrored my own in the intense physical trial before being asked to perform the required kata and tameshiwari (breaking). Words cannot adequately express how proud I am of this young man. My greatest joy though as the head instructor at Phoenix Gaithersburg is that Tim is one of many students who exhibit exemplary character. While we highlight and honor Tim, you all make me a very, very proud Sempai! Phoenix Gaithersburg has some new color! We recently worked through our first yellow belt tests as a dojo, and I could not be more proud of these students. We were blessed with beautiful weather and an opportunity to test in the great outdoors! As an instructor, I was reminded of how blessed we are as a dojo to have such active and involved parents. To see moms and dads watching from the sidelines was motivating for all of us; especially those who were in the process of earning those yellow belts! In our belt ceremony, there were several key points that I wanted to impress on the newly promoted students, and the rest of the class. First, the Phoenix Karatedo Association, Kyokushinkai does not award "kids" or "junior" belts. The requirements for each belt level are the same for adults and youth. This should build a sense of self-respect and pride in their work! Secondly, the bright color of the yellow belt symbolizes an awakening. These six students have all proved that they have acquired specific knowledge and very basic techniques/terminology. While still very early in their Kyokushin training, their brightly colored belts are a symbol to all of us that these guys have accomplished something special. Finally, for any parent or friend who observed, Kyokushin belt tests are HARD! We don't give anything to anyone. Each student must work to earn everything. As an instructor and father of 3 boys, this kind of mentality and work ethic is what I want to impress on the next generation.